Reed/BEN shines the Light of Communion with the Creator. The Reed is a Channel of Divine Communion. Reed/BEN is illustrated as an Altar. Above are the channels of the Creator’s Light shining down on the Altar. Below are the thatched prayer mats where Human kneels in Humility. Reed/BEN is the Guiding Light for Family and Home, holding a special provision for the children. BEN is a Day Sign of “Light” that will show us the way to Be a Shining Light to those in our closest realm of influence. Through a Vision of Light, Reed will inspire us to follow the Light of Divine Discernment that is made possible by Humility. Reed offers guidance for raising children to follow the path we are creating toward a Destination of Love. Reed is known for holding very High Expectations. We are meant to hold High Aspirations, but cautioned against expecting Our Way. BEN warns us to lead with a “garden hose” and not a “steel pipe.” The one that bends, will pour out the Blessings of Spirit. Reed calls us to Bend in Humility to all the Divine Ways and Means to a Destiny of Love. Reed bends to Kneel in Humility at every altar of Love. An altar is a place of Oneness. As a place of an Offering, we are always Atoned with the Creator when we kneel at this altar. Reed/BEN will inspire us to create an altar within our Heart where we Bend in Humility to the Light of the Whole. BEN is observed as a day to Bless and Repair the Home. We will create a Happy Home when a place of Divine Communion is placed in the Center. 3rd & 4th Uinals: In the harvest cycle of the Tzolk’in round, the 3rd and 4th Uinals represent the process of the Seed that becomes a sprout. Like Tones 3 and 4, the 3rd and 4th Uinals are cycles of Movement and Stability. As we reach up to draw the Light of Divinity, so will our roots reach down to be anchored by Unconditional Love. The Reed/BEN trecena includes 2 Portal Days that thin the veil to other dimensions and empower our psychic gifts of intuition and telepathy. A Portal on 6 Flint/ETZNAB will magnify an important Truth that has been hidden or covered up. This Truth will generate Momentum. On 12 Seed/KAN a Portal will magnify Love through the Truth of our Identity. 6 Flint/ETZNAB – establishes Momentum created by Discerning the Divinity of our own Truth. 7 Storm/CAUAC – will offer a Renewal and Regeneration of Spirit through the Truth of our Divine Connection to Unconditional Love. 8 Sun/AHAU – through a Revelation or Epiphany, the Sun will illuminate the Gift of Divine Justice in a Sacred Exchange. 9 Crocodile/IMIX – will complete our Transformation with the Truth that the Dreams we Love the most is our own source of Genius, and the Love holds the Patience to Wait for a Manifestation that is Willed by the Creator. The 260 days of the Tzolk’in are divided into four seasons of 65-days. The final Kin of each is recognized as the Guardian of the Season. Every trecena (creation cycle) has a Guardian of Ascension. The last Kin offers in advance a Destiny we are growing toward. The first Season ends on 13 Serpent/CHICCHAN. Germination of our Consciousness and Identity was the Purpose of our first efforts. We emerged from the darkness into the Light of Consciousness, still a sprout, imagining who we are. At the Dawn of our New Awakening, 1 IMIX (the Beginning of the Tzolk’in round) we were planted as the New Seed, the Best of a New Generation of Consciousness. Our first Awakening was Unity in Spirit. In the womb our first Truth was being part of everything. Then we were Awakened by the Voice beyond the Womb, and became Conscious of our Self. We were posed with our first Question of Consciousness. “If I am Not the One, then Who am I?” 13 Serpent/CHICCHAN will Offer the Definitive Answer through “The Knowing” Body and Soul. Reed/BEN is a trecena of “Light” that will Inspire a Divine Creation. We will build an altar of Light as the very Center for Home and Family. Reed/BEN will inspire the Spiritual Guidance for the Deer’s Mission of Love. Ascending from a cycle of Humble Communion with the Light, CHICCHAN will ignite all our Spiritual Gifts to be put into service. A Charge of “Lightning in the Blood” will announce our Gift of Knowing. Another notable Kin is 8 Sun/AHAU, a Holy Day of Transformation that represents the Sun in its Zenith. Living in a tropical region, the Maya only experience 2 Seasons – the Rainy Season and the Dry Season. The Equinox is not the meaningful measure of “Spring” or “Fall.” Instead, they calculate the Time for Planting the Corn by the Zenithal Sun. The best time to plant was between the Seasons in the “warm and moist” versus the Wet or Dry. We could expect our Transformation, carried out by Sun/AHAU, will be a Revelation and an Intervention of Divine Will. The Sun’s Mastery shining its Highest Light will Transform our Consciousness with the Inspiration, Determination, Perseverance and Acceptance to manifest our Dreams. 1 Reed/BEN sets the Tone for a New Vibration. We Ascended with the Consciousness that we were each One in a Divine Family – the firstborn of Divinity. Sun/AHAU introduced us to a Divine Relationship and a Mission carried out as Part of the One. Family is important as the greatest influence on our Experience and Understanding through the formative time in our Life. Reed introduces a Responsibility to One Another, to offer the Highest Demonstration of Integrity. “WITHOUT Integrity, Nothing Else Matters. Our Challenge will not be an Aspiration of perfect performance, but the Integrity of Our Intention, Truth, and Authenticity. Reed/BEN shows us the Power of Influence is Down on our Knees. The Truth that matters is what the Creator can do at the point of Human failure. When we express a disappointment in our Self, we admit we knew better. We have to fall so others can see how we get back up. Reed/BEN will open our Hearts with Light. The Elders’ teaching on Reed always includes the “hollow bone.” The flesh removed from the bone is our Ego. For the Creator to be seen through us, others will have to see the darkness being transformed to Light. Light is only half of what our Children need to know. They must Know the Power over Darkness. Allowing our Self to Be Seen, and Honestly Seeing our Self, will develop the Strength of the Mature Deer. Others will learn that Perfection isn’t possible by Human, but we can Stand on the Love for a Divine Intervention. On Tone 1 we imagine the day ahead. Somewhere deep in our heart is a Dream that shows up first thing in the morning. Chances are it’s an Intention that doesn’t have an experience of Success to turn back to. I have one. Mine is a different pattern of movement. Habits are so hard to break. I wake up imagining this “character” that suits up and goes for a walk. I’d get my work done, then tidy up the house. All the vegetables would be cut as soon as they were brought home, stored ready to eat in sealed containers. Organic. Half of everything in closets would be given to charity, leaving empty space for organization. At least once a week, I’d swim at the YMCA and find a community group. Instead of watching TV before bed, I’d play the piano. Okay, so I can forego the pre-cut vegetables. I think I’m dreaming to be Angela Lansbury in “Murder, She Wrote” without the bicycle. LOL None of the things I dream of are so hard. Why are they? Something in me wants to break out of this life into another. The “Feeling” of this self-empowered experience is what I dream of as a single thought. Then I immediately turn to the worst habit I’ve got, thinking herein lies the solution. If I could just do that for a day. There’s the “silly trick.” Inspired by a Dream, and turning to a Human limitation to imagine that. We are meant to Kneel, Offering our Dreams AND Limitations at the altar, so we can ALL See the Intervention. We see a Divine Intervention in every act of Forgiveness. We see someone else’s “Better Angel” making a provision for us. We can share High Aspirations for our Self, and share the disappointment when we fail. We can teach one another to Forgive our Self. We won’t end up failures. We’ll create the Light of a Miracle. We can teach our Children that everything has a Meaning and Purpose, and so do they have a reason for Being. My Dad’s pat answer to “Why” was, “Because I said so.” There was only one Authority in the family. In our Divine Family we all have Authority. It works when we hold Mutual Respect for one another. The three thought for a while until they were all ready to share their answer. The first said, “The Father should save the child, because he is helpless and will carry on the next generation.” The Elder turned to the next, who said, “The Father should save the Mother because she is his wife and he promised to protect her. They can have another child.” Then finally, the third answer, “The Father should try to save them both, so none would live with the memory of abandoning someone they love. Better to all go together.” The 3 waited to hear who had given the right answer. But the Elder said, those are all good and worthy answers. I see a good Intention in each one. To be a Successful demonstration to Family, we have to recognize our Equal Light, no matter what generation we represent. Today we’re called to be present for a Divine Inspiration to bend to the Light of One Another. Celebrate and don’t change it. Leave the Transformation for a Higher Understanding in God’s hands. See the Truth of a Divine Inspiration, especially if it’s different than yours. We can Humble our Self to Receive. Reed/BEN is said to be the day to Bless the Home. It is also observed as a day to offer help to our neighbors. Offering Provision will set the Tone for a Creation that will draw the Family together as One. When we do for one another we don’t offer it as a duty, but as a Gift of Appreciation. We don’t congratulate our effort. We edify the One who Divinely Deserves to Receive it. We deserve to See the Divinity in our Self giving that way. To all my relations, may we be Inspired to build an “altar within” in the Light of the Creator’s Love. May it be a place of Humility where we Honor and Pray for each other. May we be freed of our “sibling rivalry” and instead, offer a helping hand for a Creation that will Bless the Whole. May we honor the Beauty that is an Individual Expression and not expect that it will look the same as ours. May our Intention be a Dream we hold in Humility of our limitation to carry it out. May we reach High Enough that we Know we’ll fail, to see the Miracle of Intervention. May we be Inspired by a Divine Idea of Love and leave our limitations at the altar, where they can be Seen and Transformed by Believing in a Divine Provision. The “Light” is the cycle of Night and the Inspiration of our Dream that shines there. This is a cycle to Rest the Human mind of Reason and quiet our thoughts for the Dream. The Dream will ignite our Passion. Nothing will stop us when the Zenithal Sun shines its Light. We’ll run to plant the Seeds of our Dreams. Reed/BEN holds the Element of Fire, the Divine Gift that transforms one thing to another. Residing in the East, we will always end up in the Light. We can dream of Knowing that Anything we Love can be Manifested by a Miracle. SETTING THE ALTAR: Setting the altar for a new Intention is a worthy practice on Tone 1. We could place something Red to remember the Fire of Inspiration. We might place something to remind us of each other. So when we return there, we’ll remember to include the Dreams of the Whole in our prayers. Each day we can thank the Day Sign for the perspective they will share. And, each day we can Honor the 20 archetypes given that represent all of us Together. Any place we dedicate to Divine Communion holds open a Portal to the Creator’s Light. That’s the place the Jaguar guards in stealth a Portal to the Dimension of Spirit. Visit the 13-Day Trecena Guide for a trecena energy forecast and insight on the Uinal and Portal Days of the Reed/BEN trecena. Galactic Tone 1: Unity. One is the beginning of all things, the first, the whole and the all in one. One’s are assertive and self-guided and give a good push to whatever project they are associated with. One persons work best when meeting a challenge. Do not expect One-persons to be attentive to details or to put the finishing touches on things. Reed/BEN: Reed persons are the spiritual essence, protectors and guiding light for family and home. They are competent speakers who will take up a cause. Very tough and analytical, Reeds endeavor to bring peace, harmony and order to all o their relations. Reeds are blessed with great skill at negotiations and consoling which are very often put to the test. Although Reeds need a lot of appreciation, may have marriage or business problems because of inflexible vies and high expectations, which erode affinity. The lesson for Reed is to be like a garden hose, not a steel pipe. Bless or repair your house. Cherokee, Reed/I’HYA: REED- Symbol-Reed is the Earth, reflection of the Star Chaga of Pollux. Reed made up the Magician Twins who led the journey to bring back to life the daughter of the Sun. The Casket is Gemini. Energy for Intellectual minds, creation, re-creation, new directions, breaking the ties that bind. A trailblazer and leader. From the East, direction of success and happiness, no matter what route is taken, always ending up in the Light. How is your Spiritual path today? I love to hear from you. Share your thoughts on the day, your Day Sign, or just say Hi! April 19, 2019, a Full Super Moon in Libra is forecast as a shift into dynamic movement and transformation. See video forecasts by Pam Gregory and Barbara Goldsmith. THE WAYEB: The Wayeb is the last Haab month of 5 days; February 15-19, 2019. The Wayeb is observed as a time to wrap up old business of the year. No Year Bearer is said to be in charge during this cycle. 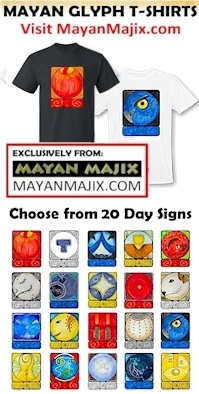 The Maya stay close to home and help their neighbors. The Light of Kinich AHAU is said to appear in the last Moment when the new Year Bearer takes its place. The Haab New Year represents a new cycle of planetary transformation. Your gift of a Sacred Exchange makes it possible to manifest a Dream.